These Thanksgiving place card holders are so quick and easy to make using the Brother Scan n Cut canvas and your Brother Scan n Cut machine. 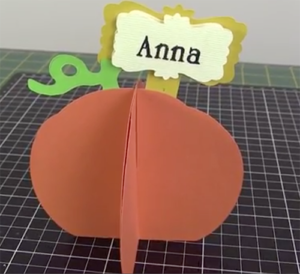 Get the kids to write the guests names on the tag and embellish the cards. You can also write the guests names on the tag using the alphabet in the scan n cut machine. There are no rules so have fun and just let your imagination run wild. You can see that we have added a second tag on top of the first to get a 3D effect and written the name on using the brother scan n cut draw function.